The Junior Award Scheme is an important and exciting initiative from English Bridge Education & Development, designed to stimulate enthusiasm for junior bridge among young players, parents and educators. It is an award scheme that offers graded attainment levels dependent upon teacher assessed ability demonstrated at the table. Our aim is to give young people positive reinforcement, confidence and a sense of achievement through monitoring and encouraging the student's progress along their bridge learning journey. We hope they will enjoy working to complete each level. Pupils at Weald Community Primary School in Sevenoaks did - you can read about them here. Creating a consistent structure for junior bridge education across the country. By having a syllabus for each level of the award, it unifies the levels of knowledge in different areas of the game for a given progression. Having a syllabus creates a proper education program and elevates bridge above being a 'simple card game' in the eyes of academic institutions. It can help others recognise the values that are being promoted by bridge – teamwork, improved social skills, numeracy, logic and reasoning. Having a formalised certificate for attainment will be popular with students to put on CVs and UCAS applications. Promoting achievement in a Mind Sport. Other activities (especially sports) within schools carry status for this type of achievement attached to them - the scheme enables recognition of this type. Providing a tangible measure of progress for students, teachers and parents at events like the annual Junior Teach-In. Promoting the England junior squad to those who wouldn’t otherwise hear of it but who might be interested in looking to achieve greater heights within the game. Giving the junior squad coaches a better immediate assessment of a candidate’s current knowledge level. It also allows them to recommend a minimum level at which candidates might consider attending squad training sessions. A suggested level is Silver for U15, Gold/Platinum for U20s and Platinum/Diamond for U25s. The teacher can apply to the scheme supervisor at English Bridge Education & Development for blank student assessment cards of the award rank required. It is recommended that students begin on Minibridge/Bronze, but more experienced players could start higher if the teacher judges that to be suitable. The teacher can then sign off each skill on the awards when they feel the student has mastered it. Some guidance is given on the marking criteria (see the Teachers Notes below) that the teachers should be looking out for. When each skill has been signed off, the assessment card should be sent back to David at English Bridge Education & Development who will issue the certificate associated with the award. Once the rank has been achieved the student can then begin working towards the next rank on a new assessment sheet. Since all the assessment is practical, it could also be that the teacher is a mentor at the local bridge club or an experienced university student should the student not be playing their bridge in school. 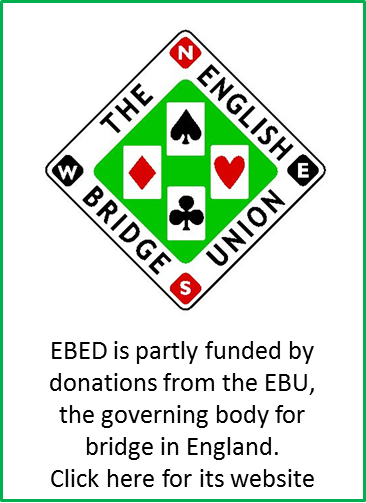 To join the scheme please contact David at English Bridge Education and Development - david@ebedcio.org.uk, or 01296 317228 - and let him know how many students you anticipate being involved in the scheme and which awards they will be working towards. He will then post the assessment cards to you. The teachers' materials are available to download below. After some thought, it was decided not to tie the students too closely to any one bidding system. This is far less important than actually getting out there, playing and having fun. Teachers will often have their own material. So, rather than prescribe something and tread on their toes, instead give them free rein to teach as they see fit. The basic principles of natural bidding apply across all systems and it is those principles we are more interested in developing. There are a minimum of conventional devices, but those selected are only the most common and have passed into use by the vast majority of players up and down the country. Cardplay techniques are, however, universal. In this area we’ve tried to cover a range of ideas that any aspiring player should progressively aim to master. While the Minibridge unit is not compulsory (as some teachers may have started on bridge immediately) it may be worth noting some of thecardplay techniques that are mentioned in this unit as a precursor to undertaking the Bronze award. There is also some overlap between the two units as beginners may start with either. Finally, there are some achievement criteria for actual playing experience and behaviour. We value good behaviour, courtesy and ethics as an integral part of the game so feel the awards should reflect these standards. The diamond award also suggests a player should both play in a national event and attend an England Junior squad session. As part of the scheme for the diamond award, the student can obtain free entry to a national event (from a list of such events). They will also be put into contact with the England U20 squad manager, who will then inform them of the timetable of future sessions. It is left entirely in the hands of the teacher to decide if the student meets the criteria required to achieve each task at each level. It should be noted that we are looking for the student to be able to complete the skill on a regular basis rather than achieving it for the first time. It is also important, particularly with the cardplay that the student understands the 'why' and 'when' as opposed to purely the 'how'. The guidelines for teachers for assessing each level of the scheme are available here. Juniors who have received their certificates for reaching Silver Award or above in the Junior Award Scheme are listed here.